The species may be territorial. While individuals came close to each other it appeared like there were brief chases and overall there was an emergent spatial pattern (I think you can see it in the first video) suggestive of territoriality. I tried to follow the movement of a single individual but it was too difficult for me. The fact that the colors of the leaf are similar to some of those found in the wasps themselves made me wonder if I could elicit the behavior with another leaf. The leaf I chose to use, unlike the one I found them naturally interacting with, was entirely yellow. What do you hypothesize will happen? 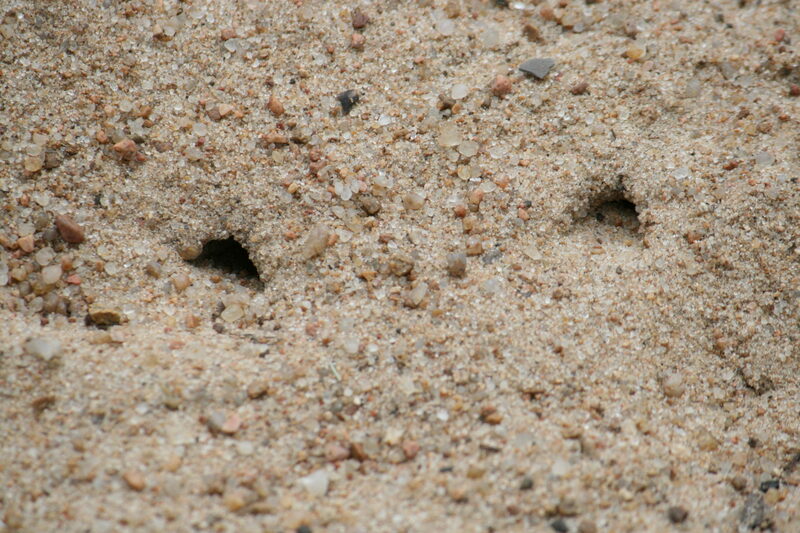 Around the periphery of the volleyball court, I noticed holes in the sand that were approximately the same diameter as the cylinder shape of the insect themselves (see below), although maybe a bit weathered. I should have dug them up but didn’t think of it at the time. I had noticed similar behavior in a much smaller number of cicada killers in a children’s sandbox, but had no idea what type of hymenoptera this species was. Similar, I wondered, was this a mating swarm? Where they recently emerged individuals? What was the ratio of genders? How long does this behavior persist? What resources might they use to maintain their energy? A few curious individuals did happen to come by while I was making my observations, and I received seemingly conflicting reports on their longevity. One adult mentioned that they are there all the time, while a couple of kids arriving to play volleyball hadn’t noticed them there the day before. 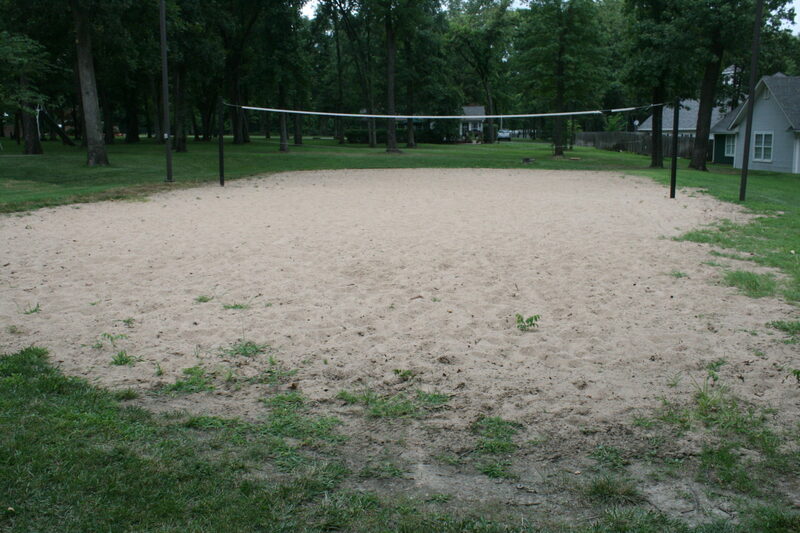 In fact, later that night I saw, from afar, four people playing volleyball. I might add, that to get some of the images and video, I walked in amongst the swarm. I did so slowly but felt that they may have ignored me even if I had walked in at a normal pace. As mentioned in response to Brad’s post on aphids, I think a collection of such videos and images could make an interesting series of ecological activities for students, and possibly a series of models for them to produce their own reports, blogs, etc… on interesting outdoor observations that can motivate learning of particular ecological principles. For anyone that responds with the answers, unknown to me with any certainty, it would be nice, and potentially helpful in the future, for you to provide links to websites that helped in your identification. 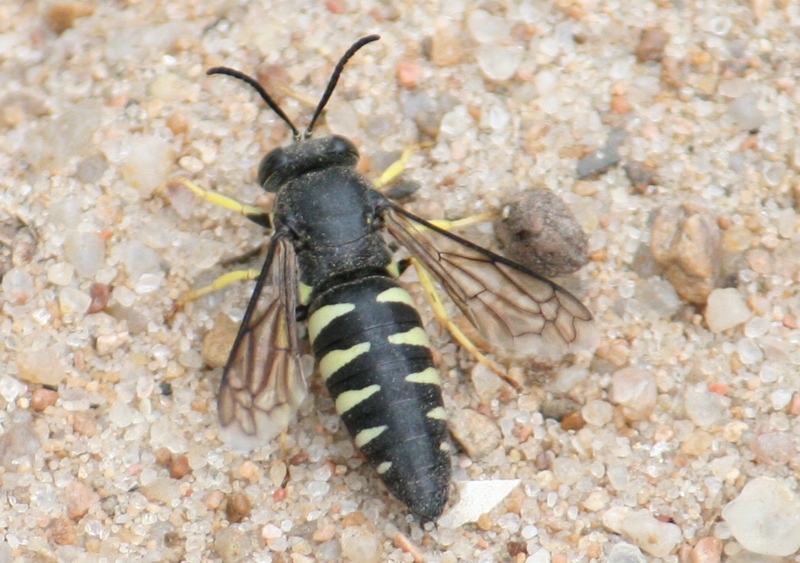 “….The hovering wasps are likely all males (and hence harmless as only females have stingers). I suspect that your hypothesis of the dead wasp being a female is reasonable and that both visual and chemical cues are being used by the males. However, I don’t believe that the males are territorial in the strict sense ( territory = any area defended for exclusive use against others of the same species). Rather I suspect what Eric sees is a kind of scramble competition among males who are continually searching and vying among themselves for potential mates (= virgin females emerging from last years nests). Barring a major change in the volleyball court, the wasps will be back again next year, almost certainly. Perhaps Eric will want to try to also dig out some nests. 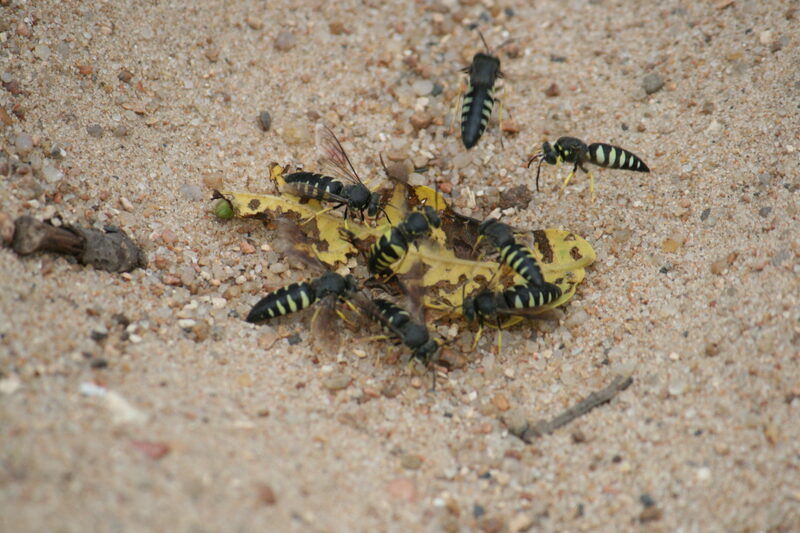 Careful observation may also reveal the activities of some of the sand wasp parasites such as velvet ants and satellite flies. While much is known of the natural history of Bicyrtes, there is still much that can be learned from careful observation and simple experiments. Otherwise, I figured they frequent the same sites year after year. Two of my children just observed a cicada killer capture prey and fly it into an excavated area under our porch in the back yard. I have seen another cicada killer use this same spot for the past couple of years. Now I need to find a cicada and get some more video to post. I bought an extra paperback copy of Wasp Farm, last year up in one of the Ithaca used book stores just in case it might be needed. It’s yours if you want it…..
BTW….I think there is a good chance they will be there if you get back, next year. I believe that they are males as well. I found information somewhere on the web that mentioned swarming being associated with the males waiting for the emergence of the females after they have developed within the nest. This is what I imagined since the nests appeared like they hadn’t been used in a while. I will have to get a copy of the Wasp Farm, and I most certainly wish I would have had web access while I was there, so that I would have been able to generate hypotheses while still there and test them in some capacity. I’ll just cross my fingers that they will be around next year when I visit. Another difference mentioned by Evans between ventralis and quadrifasciata is the type of sand selected for nest habitat with quadrifasciata preferring a fine sand compared to the coarse sandy soil preferred by ventralis. Both wasps create uni-cellular nest stocked with stink bugs. Kind of makes you want to go back doesn’t it? According to this perhaps we should be considering Stictia instead…. Based on my surfing around I would agree that they are sand wasps in the genus Bicyrtes (Bycyrtes). So, I assume that you are concluding that these wasps were stocking their burrows with prey species that they were collecting as the hovered about the sand? I am not completely sure if this is what they are doing. I never observed the individuals capturing any prey or entering or leaving the burrows. I am sure that that happened at one time but some of the literature that I found suggests that this may be a swarming behavior that occurs some time after the eggs have been laid in the burrows and stocked with food for the larvae. So, any other hypotheses about why they may swarming around? I appreciate the links and find it quite interesting to see how people respond to multiple videos from the past couple of posts. 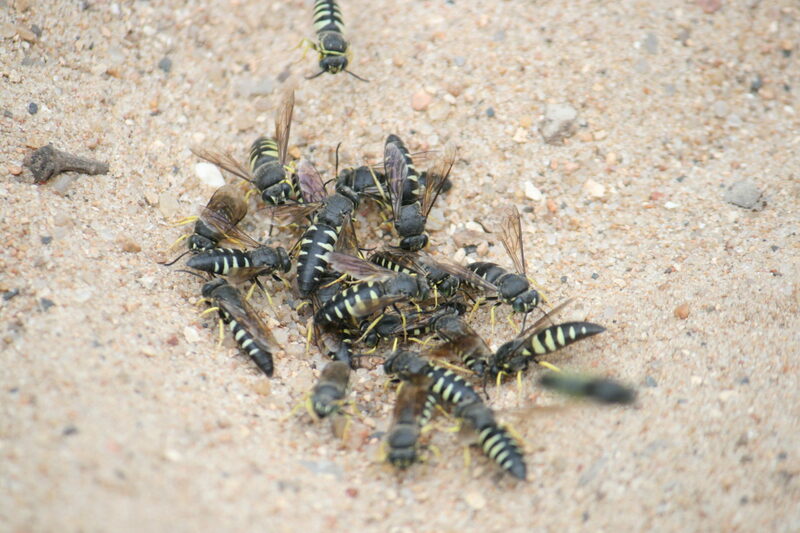 It is clear that these are some form of sand wasp. My first inclination was some sort of bee wolf but these are the wrong color for most bee wolves. After a bit of internet sleuthing and paging through some of my insect books I came to the conclusion that these are either Bembix or Bycyrtes. Both groups stock solitary burrows with prey species (flies for Bembix and stinkbugs for Bycyrtes.) Based on habitat and behavior reported I’m pretty convinced that these wasps are Bycyrtes quadrifasciata.